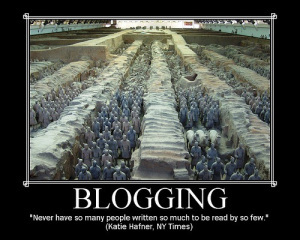 Blog Advice 1: Increasing Your Traffic | Sally Ember, Ed.D. 03/21/2015 by Sally Ember, Ed.D. Great ideas and #blogging #tips from Suzie! WORD! How do I increase the traffic that I receive to my blog? Building a following and, consequently increasing your traffic, takes lots of time and effort. You are extremely unlikely to receive thousands, or even hundreds of views simply by pressing the publish button. Content is key. Well-written posts will draw new people in, and encourage them to visit again. Posting page after page of inspirational quotes looks pretty, but will leave your audience bored after a while. Be yourself, make no apologies and believe in what you are creating. ← I am NOT Irish and/or Catholic and I do NOT wear green: don’t you dare pinch me today!